What? Besides write?! Well, I think I’m a real good dad. Plus, I won 2nd-place in a hog-calling contest at the country fair when I was a teenager—I’ve never owned hogs, though. I love to hit baseballs. I’m just finishing John Hornor Jacobs’ This Dark Earth, just starting “Author and Finisher of Our Flesh,” a Gorias La Gaul story by Steven Shrewsbury, and I’m in the middle of re-reading the stories in Kelly Link’s Magic for Beginners for a project I’m working on with a student. And I’m lovin’ ‘em all. Both. I work in one (academia—I’m still not sure how I got there), but my office there is plastered with the Hulk, the Reds, Batman, Waylon, Stephen King, Sons of Anarchy, Justified, etc. Same with my writing—I’m no esoteric literary writer by any stretch, but I do think my work, though raw, shows hints of the literary crowd’s influence, occasionally . . . Okay, maybe not! Outlaw country, especially Waylon Jennings, and hard-drivin’ rock ‘n’ roll like AC/DC, but I love the blues, too, and bluegrass. I’m a big believer in discovering stories as I go. A story I already know is already a boring story for me. I like to start with an image or character or setting—ideally all three—and just see where it takes me. I can do this since I’m primarily a short story writer. I did it with a novel, and that’s probably why I’m in the home stretch of a massive rewrite on that son-of-a-gun. Well, I’m way past crushes in my life, but I wouldn’t mind doing shots with Sheri Moon Zombie and trying to get her to dance or do that hysterical laugh for me. 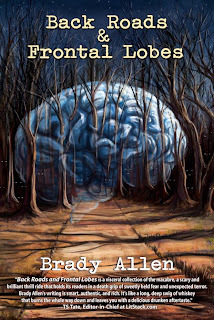 Brady Allen is the author of Back Roads and Frontal Lobes (Post Mortem Press, 2012), a collection of 23 tales in the genres of horror, crime, the road story, soft sci-fi, dark fantasy, surrealism, existentialism, the weird tale, and even some plain ol' realism. 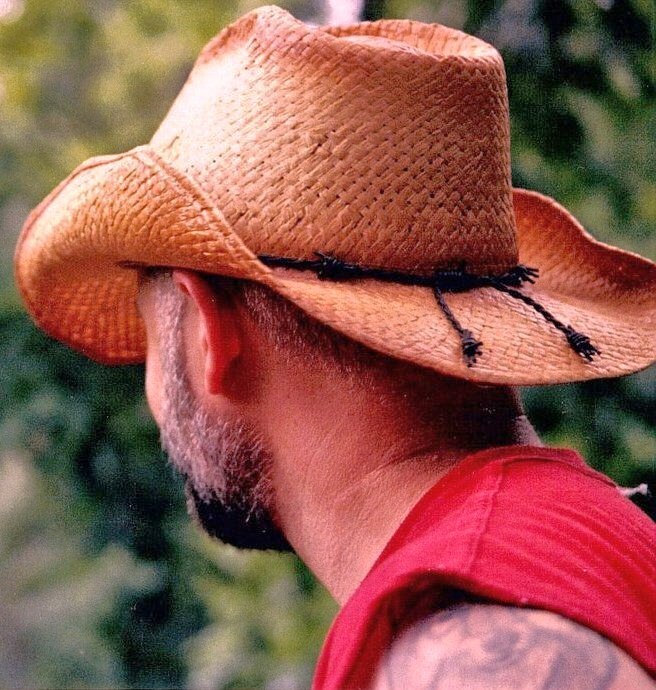 He has published numerous short stories in magazines, journals, and anthologies in the U.S, England, and Ireland and has received honorable mentions for a couple of them in the Year's Best Fantasy and Horror volumes from St. Martin’s Press, as well as an Individual Artist Fellowship in fiction from the Ohio Arts Council for three others. He loves Reds baseball on a transistor radio, and the sound of a train in the still of the night. 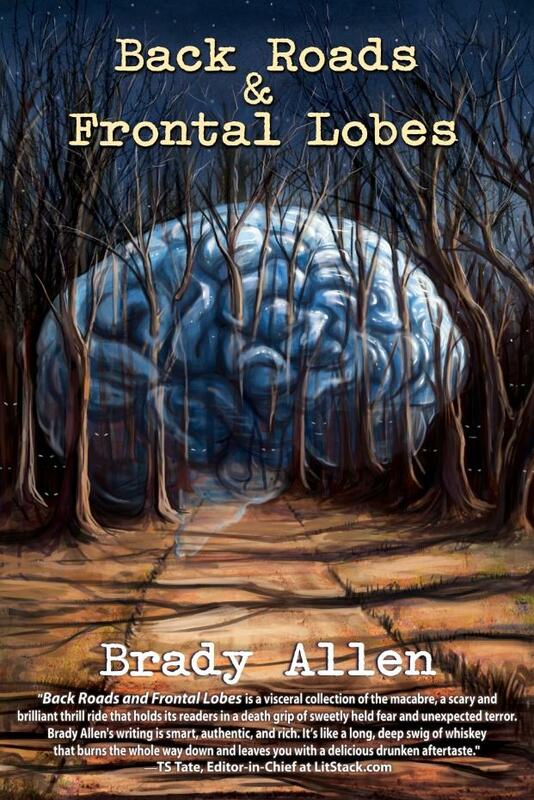 DESCRIPTION FOR Back Roads and Frontal Lobes:These 23 short tales take you along dark, unlined roads and into dark minds less traveled. Held together by themes of isolation and loneliness, existentialism and hope, and choice versus fate, and at turns both disturbing and darkly comical (while often tinged with sadness), this collection of stories explores both speculative fiction and realism: horror and dark fantasy, road stories and crime, dark drama and soft sci-fi, and surrealism and magical realism. Thanks for picking six, Brady! And congratulations on your new book.